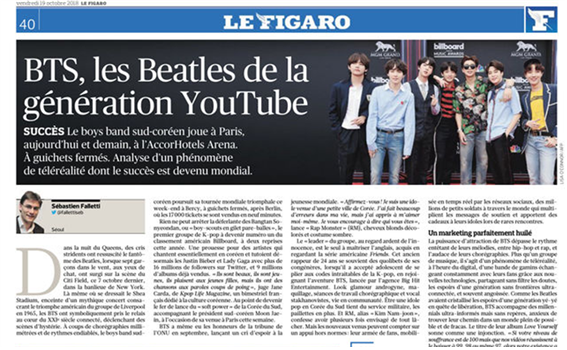 The article from Le Figaro said that “from the cheers that erupted when the seven members of BTS appeared on the Citi Field stage in New York on October 7, it seemed like the Beatles had returned.” BTS, as stars of the 21st-century Internet age, seems to have inherited their pattern of success from the Beatles fever in the 20th century. Known for their precise, practically error-free choreography and fervently rhythmic songs, BTS performed both in the US and Europe as part of their Love Yourself world tour. 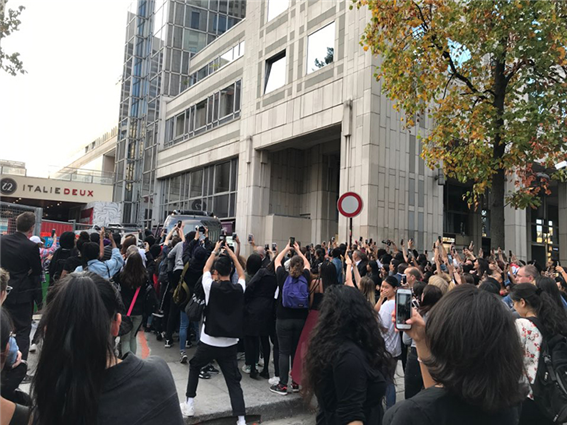 On October 15, they performed the finale at the Korea-France friendship concert in Paris, where President Moon Jae-in was making a diplomatic visit, showing off Korea’s soft power. Their following show in Berlin was sold out in just nine minutes—all 17,000 seats. In their run, BTS has achieved unprecedented feats for a K-pop band: sweeping the top of the Billboard charts twice and accumulating the kind of popularity seen by stars like Lady Gaga or Justin Bieber. Their success seems set to continue. “BTS members are young and handsome, so they are very popular with the female fans. Their lyrics are especially piercing,” said the editor-of-chief of K-pop Life Magazine, a magazine on Korean culture. The analysis in Le Figaro added that “the lives of Korean idols are akin to serving in the army in glittering gold-studded clothing. Although their lives seem glamorous—which is apparent in their flashy androgynous fashion and makeup—there’s an enormous amount of singing and choreography practice and communal life involved.” The work isn’t without payoff though, as BTS continues to receive letters and gifts from millions of “Army” fans across the world.